With all the scams online, it’s becoming more and more apparent that an association needed to be created to protect the consumer and the home business owner. 1: You have a “zero spam” policy and do not send unsolicited emails to my team members, customers, or prospects. All mass email correspondence is CAN-SPAM compliant and contains an “unsubscribe” link for easy removal from my lists. You respect the privacy of individuals will not sell or distribute their contact information to a third party without their permission. 2: The company(s) you represent are in good standing with the FTC and sell value-based products that improve the lives of you customers. 3: You do not represent, endorse, or promote illegal pyramid schemes, or “cash-gifting” programs. 4: You do not represent, endorse, or promote “forced-matrix” programs. 5: You pledge to provide training and support to your team members, and make your contact information readily available to your customers and/or distributors. 6: You pledge to conduct your business with honesty and integrity. 7: You will continually further your education and development as an entrepreneur so that you may achieve the level of success you desire. 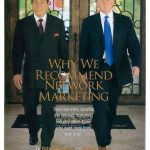 I’m proud to be a founding member of the Association of Better Networkers and say “it’s about time”. I like every one of these conditions but numbers 6 and 7 are close to my heart. I believe this will sift the serious entrepreneurs who genuinely care and want to make difference from those who don’t. The tire kickers and those not committed to excellent entrepreneurship will not want to expend any time, money, energy and effort into furthering their education or belonging to the ABN. When I had a real estate license, I chose to abide by the Realtor code of ethics which I was proud of. It reminds me very much of that. The home business owner must be verified and is watched by others in the community and online to ensure the code is being upheld. It’s a tight ship, and I’m glad. If you’re a business owner and wish to participate in the Association of Better Networkers, you can JOIN HERE NOW. Thanks Debbie for the great information, we have to realize the importance of integrity when we represent ourselves and our business. The ABN is a great way to represent yourself as a serious business owner. .-= Mick McCrory´s last blog ..How To Optimize Your MLM List =-. I just learned about this association and have just signed up for membership. I applaud your efforts along with your co-founders to make the home based business industry better. Like the BBB for brick and mortar, home based businesses that are legitimate and real need to be recognized as such. Thank you! .-= Mary Lou Kayser´s last blog ..Why Saying Thank You Will Increase the Value of Your Personal Brand 100-Fold =-.